ZIMBABWE – Former vice president Joice Mujuru’s dramatic entry into opposition politics has shaken ZANU-PF to the core, forcing President Robert Mugabe’s party to canvass its sharpest brains across main wings to respond to the challenge in order to guard the party’s turf. Mujuru — the second most powerful politician in ZANU-PF until her dismissal in December 2014 — launched her own party, the Zimbabwe People First (ZPF), at a Harare hotel on Tuesday. She immediately declared her presidential ambitions, setting the stage for what promises to be a bruising battle between Mujuru and her former boss, as the nation trudges towards the 2018 polls. ZPF’s launch ended months of speculation over Mujuru’s political ambitions. While in public the ruling party has dismissed Mujuru’s political rebirth as a non-event, the Financial Gazette can reveal that there are behind-the-scenes manoeuvres by its officials to put spanners into the works so that ZPF does not threaten ZANU-PF’s hegemony. In the coming weeks, ZANU-PF is seen bringing back all those officials who were suspended for varying periods for aligning themselves with Mujuru in a bid to stem the possibility of a mass exodus of disgruntled cadres — including their supporters and sympathisers — to ZPF. The list of officials to benefit from the lifting of suspensions include Webster Shamu, Nicholas Goche and Francis Nhema who became victims of a ruthless purge that rocked the party between December 2014 and last year: Dozens of legislators whose departure could trigger yet another round of costly by-elections, are also lined up for clemency. The absence of these suspended officials at Mujuru’s press briefing on Tuesday seems to suggest that they are not yet ready to cross the floor. Also, there is a silent war being fought by ZANU-PF to re-unite former fighters of the liberation struggle by bringing back Jabulani Sibanda into the fold. While Sibanda has already pitched his tent in ZPF, he has lately been courted by ZANU-PF bigwigs who are desperate to heal the rifts within the Zimbabwe National Liberation War Veterans Association (ZNLWVA) by convincing all the war veterans who have been attending ZPF’s meetings to “come back home”. Sibanda, who was dismissed from ZANU-PF in 2014, was conspicuous by his absence at Mujuru’s party launch, giving credence to speculation that the ruling party could be within the cusp of winning him over. Indications are also that ZANU-PF could be seriously reconsidering halting its purges fearing this could work to add numbers to ZPF. As such, the Politburo — ZANU-PF’s highest decision-making organ intermediate congresses — is under pressure to rule on current cases before the National Disciplinary Committee when it meets in the capital today. Over and above that, the State machinery could be unleashed on ZPF in the same way the governing party has manipulated State apparatus to weaken opposition parties. ZANU-PF is accused by its rivals of infiltrating their structures, sponsoring discord within their ranks and using archaic laws and regulations to frustrate freedom of association, assembly and free speech. As if to confirm this, President Mugabe sarcastically predicted in Masvingo on Saturday that ZPF might disintegrate. “Avo vakabvawo kwedu vakamboedza kuti vangatore zita redu vakari nzvengesa. Vakati tinoda kuti tizonzi People First. Aaaaah uchanzwa People First, People Second, People Third, People Fourth.Regera. Zvinoramba zvakaita mutorododo zvakadarowo mumugwagwa. ZANU-PF will remain ZANU-PF, very strong, no change,” he said. Loosely translated, the ZANU-PF leader envisioned ZPF splitting into several formations. Already, ZPF must brace for a tough contest over its name which might spill into the courts. ZimFirst leader, Maxwell Shumba, recently claimed that Mujuru’s party had stolen their name. “Let’s see how, with her small brains, she (Mujuru) intends to implement our vision. She even expects us to stand by and watch? No, nada,” Shumba was quoted as saying last week. Political analysts are cautious about Mujuru’s chances of finally ending ZANU-PF’s lengthy dominance of Zimbabwe’s political space. The consensus among observers is that it is not yet clear how big Mujuru’s support would be and whether it would be enough to loosen President Mugabe’s tight grip on power. There are also suggestions that aside from ZANU-PF, Mujuru could also be fishing from the ponds of fellow opposition parties, chiefly Morgan Tsvangirai’s Movement for Democratic Change (MDC-T). 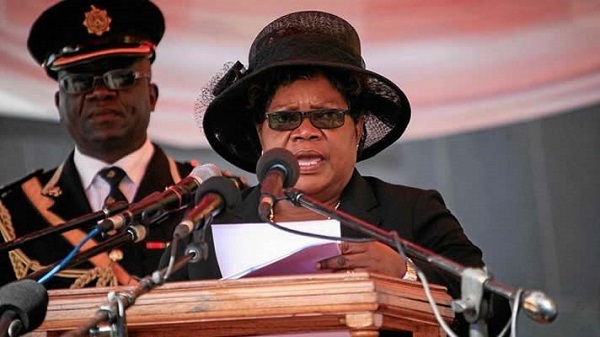 Political analyst, Nhamo Mhiripiri, said Mujuru might get some following across the political spectrum, but it would be folly not to foresee a situation where even in her party, divisions could also arise, resulting in people trooping back to their original parties. “We still have people in those parties who are still affiliated to them by virtue of having benefited in one way or the other. For example, we know that many in ZANU-PF got farms through the land reform programme and, in as much as they would want to join her, they might not be able to do so as they seek to protect their land,” said Mhiripiri. “Even those from MDC, some of them use it as a conduit to access donor money and they would not want to risk that. Politics is now like a business in Zimbabwe where people follow a party where they think they will benefit somehow, so it might not be as easy as it seems for her to get as much support as she would require,” he added. The current electoral and political terrain also remains grossly unfavourable to opposition parties. Mujuru herself seemed alive to that fact because in her inaugural address as an opposition party leader, she called for the levelling of the political playing field — the same appeal that has been advanced by the MDC-T, but repeatedly dismissed by ZANU-PF as publicity stunts. Earnest Mudzengi, a political analyst, this week warned against ruling out Mujuru saying she has proved to be a significant political force in the country. “If you look at the composition of their leadership, you will realise that ZPF comprises of people who were once within the ruling party. It was essentially formed by people who have been high-ranking officials of ZANU-PF and therefore they obviously left a hole in the ruling party,” said Mudzengi. Mudzengi said ZANU-PF now finds itself in a tricky situation as it can no longer score easy propaganda points as it did with the MDC-T.
“One narrative on which ZANU-PF has thrived against MDC-T is that no one from there had liberation war credentials, but now we have in our lives a totally different entity which boasts of people with the same war credentials as possessed by those in ZANU-PF. That narrative is now difficult to pull against ZPF,” he said. Political commentator, Otto Saki, said ZPF must brace for ZANU-PF’s shenanigans. “It’s not about if that happens to them, but when it happens. The most immediate aspect her party brings to the table is the continued demystification of ZANU-PF from former insiders. The statements that there are still others in ZANU-PF or government that support People First will soon be tested as happened with Mavambo/Kusile/Dawn in 2008. It will be embarrassing for People First to face its ‘Waterloo’, before completing its political infancy as elections are less than 28 months, all things being equal,” said Saki. While many in ZANU-PF have been sitting on the fence ever since Mujuru was booted out, her daring move on Tuesday thrust the ruling party into a state of panic at a time it is torn by factional fighting. With the ruling party now in the middle of another implosion, this time pitting Vice President Emmerson Mnangagwa — Mujuru’slong-time nemesis — against hard-line party hawks trending under the Generation 40 (G40) moniker, there is trepidation that any more losses to Mujuru could spell doom and gloom for the 53-year-old party. G40 is as bitterly opposed to Mnangagwa’s rise to the country’s top job as it was against Mujuru during her time in ZANU-PF. President Mugabe has been calling on his wrangling lieutenants to set their differences aside and work together. Two weeks ago, he made a surprise state of the nation address, strongly reproaching his charges for a terrible spate of division. He repeated the calls for unity during his birthday celebrations in Masvingo at the weekend, suggesting that he could be responding to pressure from somewhere. President Mugabe also departed from his denials that ZPF was a myth, electing instead to chide them saying they would not go anywhere. This week, ZANU-PF national spokesman, Simon Khaya-Moyo, put up a brave face saying the ruling party was a “colossal entity that cannot be bothered by the launch of just another opposition party”. “ZANU-PF is a revolutionary party. We are not a timid party — it’s a massive revolutionary party with thousands upon thousands of supporters across the country. I have the mandate to speak for that party and I am saying let those opposition parties do what they do, we remain a strong movement,” he said. “They have spokespersons in their parties, I do not want to speak for them,” he said when asked if he thought ZPF had the capacity to upstage ZANU-PF in a national election.